Ernest H. Urquhart | The Leverage Network Inc. Ernest H. Urquhart – The Leverage Network Inc.
Ernest H. Urquhart (Ernie) is an Independent Consultant and President of Urquhart Consulting based in Scottsdale AZ, serving clients nation-wide. Urquhart Consulting is committed to working with mid-late executives across all industries on issues of personal and leadership development as well as career transitions. Prior to the development of Urquhart Consulting, Ernie worked with Catholic Healthcare West (CHW), now Dignity Health, as Senior Vice President/Chief Human Resources Officer. In his role as CHRO Ernie was responsible for creating and leading implementation of effective human resources strategies for over 50,000 employees of this integrated health care system at over 40 facilities in California, Nevada, and Arizona. During his tenure with CHW he also put in place innovative leadership development programs to build diversity and sustain the organization’s mission and values into a volatile and complex future. Dignity Health is now the fifth largest hospital system in the nation and the largest not-for-profit hospital provider in California. Ernie has a passion for leadership development as a core competency for growth and sustainability in organizations as well as for individual professional development. He has worked his passion throughout a successful corporate career with organizations such Harcourt, Inc. as Senior Vice President Human Resources Worldwide, and similar executive roles at Johnson & Johnson, and Exxon Mobil. 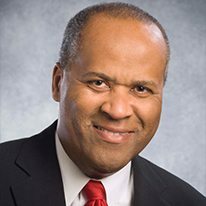 Previously Ernie served as a member of the Board of the National Association of Health Services Executives (NAHSE). He also served as Co-Chair of the CEO/Senior Executives Conference. Ernie serves as President and Chair of the Board for The Leverage Network (TLN). The Leverage Network is a non-profit organization committed to the promotion and advancement of African Americans to health care executive leadership, governance, and entrepreneurship roles.